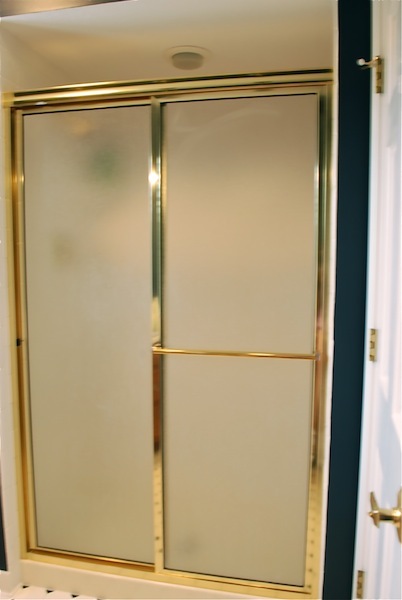 The ugly brass shower door. What did you think I was going to say? Sorry. I live in a house full of boys and potty humor is all the rage. 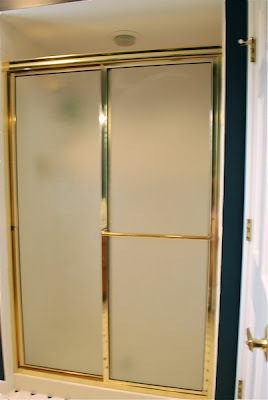 Anyway, I really don't care for the shower door, but I also don't want to spend money replacing it at this time. A tension rod and drapery panel, and voila! 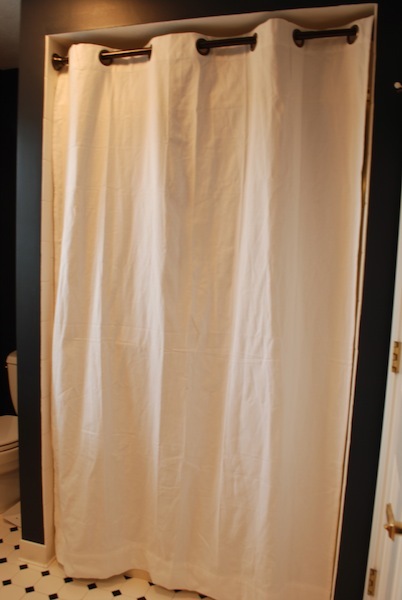 A shower curtain would not have been long enough, so I used an inexpensive drapery panel that I picked up at World Market. It was a bit too long, so my friend hemmed it for me. I have the same "stinky" problem & I keep telling myself that some day soon I am going to spray paint the brass. This is a less messy, faster solution. Looks great! Did you actually remove the shower door or are you just hiding it? Great solution, Carolyn. I may just have to steal this idea for my ugly shower unit in my gorgeous guest bathroom. I had these in every bathroom in this house when we moved in. I just took them out. I did it myself. It's not even hard. A couple of screws and some razor blades to get rid of the silicon and they were gone. It always tickled me that they were also gone from the garbage curb too. Fast! Who would want them? I did very obligingly leave the tracks right beside the doors, and man, they were snapped up so fast. 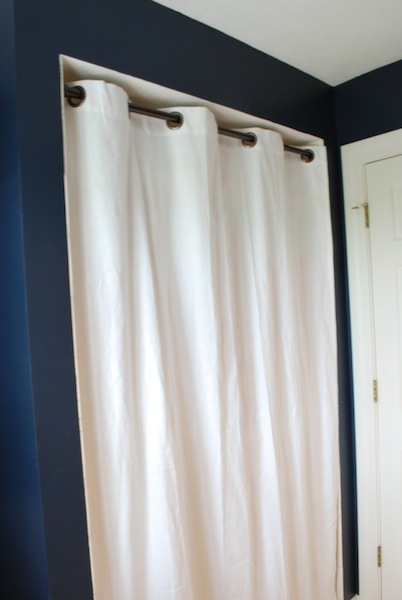 Then I just added tension rods with shower curtains and who would ever know that those babies were ever there. Who can bathe a baby with those tracks in place???????? Not that we have babies, but I'm just asking. I've done this myself in a previous home and it's such a great solution when budget is tight or I'm just plain lazy. Yours looks great! That was a cute idea! Not only is the brass gone ( I still have that in my bathroom too) but the fabric softens the room a bit too! Plus, you won't have to clean that shower door anymore. So simple and brilliant! Great job. I did the same.. and to get them high enough I used really tall panels from Ikea.. can't beat their prices that is for sure!! and AHEM.. I thought SOMEBODY was going to be learning to sew???? ?